The number of people who regularly attend church services in Scotland has fallen by more than half over the last 30 years, according to a new survey. A census of Scottish Christians found that there are around 390,000 regular churchgoers north of the border, down from 854,000 in 1984. 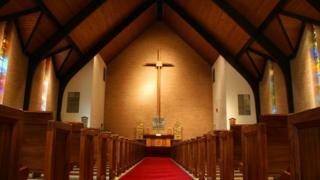 The research also revealed that 42% of churchgoers were aged over 65. One leading cleric said the findings presented a "crisis and an opportunity" for Christians in Scotland. The statistics were revealed in the results of 2016 Scottish Church Census, which was recently published by Brierley Consultancy. 43% of leaders are responsible for more than one church. Lead researcher Dr Peter Brierley said the figures indicated a crisis in Christianity across Scotland. "We are living in the 21st century and one of the features of the 21st century is that people's allegiance to particular faiths is no longer as strong as it used to be," he said. Image caption One leading cleric said the survey results presented a "crisis and an opportunity"
He said the main reason for the decline in church attendance was the deaths of elderly churchgoers. "Part of the problem is the proportion of people in the church who are elderly is much greater than in the population of Scotland as a whole," he said. "So, you have a great number of churchgoers dying. The rate of replacement is not as many. That's the basic reason for decline. "It's not that people are moving away from the faith, although I'm sure some are, but in general terms that is not the case. "There are also quite a lot of invisible Christians who used to go to church, still believe in God, but they have moved house, perhaps to a rural area, and simply haven't found a church to go to." The census also revealed growth among some denominations in some parts of Scotland. Attendance among the Pentecostals has doubled since 2002 and now stands at 19,000, making up 5% of all churchgoers in Scotland. The census also revealed a growth in new churches - 12,000 people regularly attend around 300 new churches started since 2002. Researchers said many immigrant churches and so-called "Messy Churches", which are more informal gatherings, account for much of the new growth. They credit a 2% growth in church attendance in Aberdeenshire to the influx of a large number of Polish migrants, mostly Roman Catholic, to the oil industry. The Reverend Dr David Pickering, Moderator of the United Reformed Church Synod of Scotland, said the census did not make "terribly happy reading". He said: "It's a crisis and an opportunity. Both present themselves. "The Scottish Church Census doesn't make terribly happy reading. But it also presents a new opportunity for the church to portray the love of God and the good news of Jesus in a new way for a new generation. That's an opportunity and a challenge for us. "Although I wish it were different, I think we must acknowledge that most congregations have more older people than younger, and most young people simply do not see the relevance of God, of Jesus, of the church, to their lives. "And, of course, there are now more things to do on Sundays than there were even a generation ago. "I think if the church doesn't respond [to the decline in numbers], it is a crisis. If it does respond and it embraces the situation, that's positive." The Bishop of Paisley, John Kennan, admitted he loses sleep over church attendance figures. He said: "The real crisis that's going on is not that people aren't coming to us, it's that we've stopped going to them. It's a geographical and a human reality. Essentially, we've stopped being part of the homes and lives of ordinary people. "To be honest with you, I lose sleep over the declining numbers. If the numbers are declining because there's something we could be doing that we're not doing then that's something we should lose sleep over. "There's a sense that we could do this better if we thought about this, came together, and had some kind of a plan."